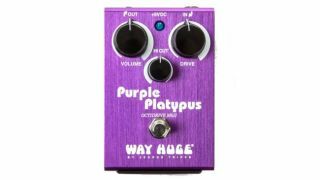 Way Huge has announced its new Purple Platypus Octidrive MKII pedal. Like its predecessor, the Purple Platypus Octidrive MKII combines the tones and gain of the Red Llama pedal with a frequency doubler that creates an octave-up effect. The pedal's sounds range from ring modulator style effects to absolutely huge octave fuzz. In addition to the original Volume and Drive controls, the MkII comes with a Hi-Cut control that allows users to shape and season sounds to their own tastes. The Way Huge Purple Platypus Octidrive MKII is available now for $149.99.